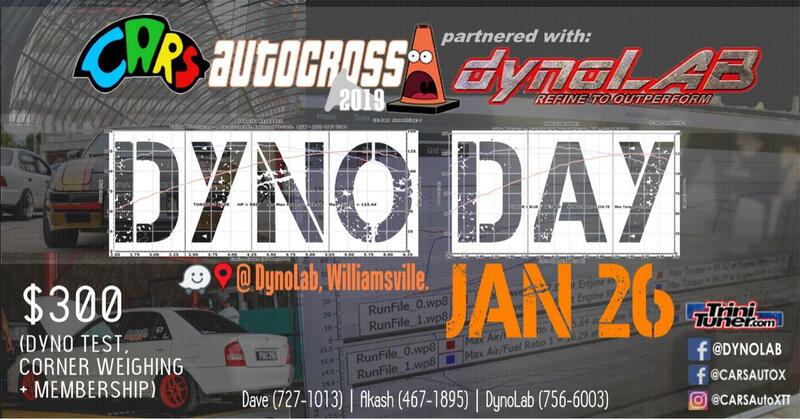 For anyone interested in competing in the 2019 Events CARS will be hosting the first Dyno Day of the year on January 26th at Dynolab. Here the executive of the club will be available to answer questions on the way cars are classed as well as any questions you have about getting involved in Autocrossing. The classing system has evolved over the years to try to ensure that cars of similar capability will be grouped together making Autocross competitive whether you drive a stock vehicle or heavily modified one. This is done in two stages. Stage 1: Power and weight are measured to determine the cars Power to weight ratio(PWR). The power will be measured on the Dynolab dyno with a factor to determine bhp being applied for 2wd or 4wd vehicles. CARS will also have scales available to get an accurate vehicle weight. Once the power and weight are measured and a PWR calculated your car will be put into a base class. Stage 2: Modifications will be checked. The lift at Dynolab will be used to do an inspection for modifications to suspension. (springs, coilovers, sway bars, tyres etc) and points will be applied depending on the mods installed. After 4 points your car goes up one class from the base. If a further 5 points are added then the car will be placed in another class up. You can also sign up to become a member on the day. Cost for Dyno, Weighing and Membership is $300 and membership entitles you to free entry to all CARS events for 2019 as well as reduced entry fees at all competition events.